Like all expectant mummy's I couldn't wait to start packing my hospital bags for our impending arrival. As I didn't really know anybody at the time who's recently been in labour I had to rely on websites to point me in the right direction. One website that I relied on heavily for advice and shopping was Kiddicare, as well as shopping they also have a blog and some very handy buying guides. I found this Kiddicare blog really helpful when buying for my hospital bag. My own hospital bag was from New Look and had wheels at one end and handles which was ideal to wheel around. 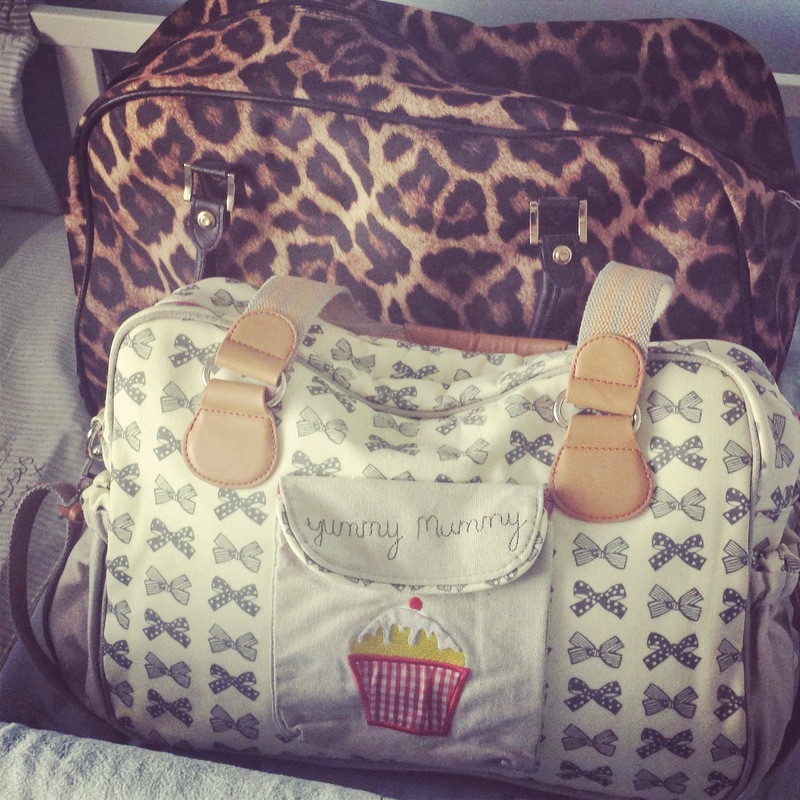 Baby's hospital bag was his Pink Lining 'Yummy Mummy' Changing bag. Pink Lining have such a great range of changing bags and accessories. Large bath towel - for that first shower after labour. The most amazing shower I've ever had. Flip flops or Slippers - I took flip flops with me. It was summer and I thought for showering they would be handy to use. Basic knickers - I'd suggest black and plain, don't go using your nice underwear. It WILL get ruined. Also try buying the next size up to what you usually are so that you can fit maternity towels in. 2 vest Tops - I'd bought a few basic maternity vests from New Look, they have a really good range. 2 Pairs of plain black leggings - I literally lived in leggings/jeggings towards the end of pregnancy. Nightie - I bought a shirt nightie from Primark which had buttons at the front, easy access for feeding. Breast pads - I didn't actually use these until a few days after I had been home. Toiletries - toothbrush, toothpaste, mouthwash, shower gel, dry shampoo, deodorant, face wipes, moisturising cream. For me I think I had everything I needed, there wasn't anything else I wish I had. Are there any essentials you couldn't live without in your hospital bag?